Angels Gate Winery, based in Niagara Escarpment & Twenty Valley is the place where great tasting food and excellent wine come together. It was established by a group of wine lovers on property that once belonged to the Congregation of Missionary Sisters of Christian Charity, Ontario. Angels Gate combines both traditional and advanced techniques of wine preparation to produce wine that of delicate elegance, balance and structure. Wines in Angels Gate Winery are treated carefully and subject to the least bit of fining and filtration. In this way, Angels Gate is able to keep the aroma, structure and acidity of each varietal intact. 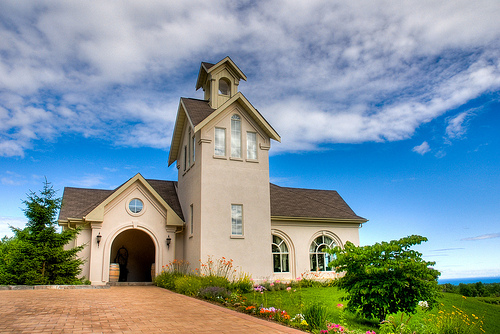 Chardonnay, Cabernet Franc, Reisling, Meriot, Shiraz, Semilion-Sauvignon Blanc, Gewurztraminer, Gamay Noir and Gewurztraminer are different kinds of wine available in Angels Gate Winery. Jun.-Oct., Mon.-Sat. 10 a.m.-5:30 p.m.
Nov.-May, Mon.-Sun. 11 a.m.-5 p.m.